Booming Bhutan The Happiest Place on Earth? This article is the second installment of a five-part series examining the world’s fastest-growing economies, according to the IMF World Economic Outlook. The tiny kingdom of Bhutan, wedged into a Himalayan crevice between India and China, has experienced unprecedented growth in GDP — an estimated eight percent between 2011 and 2012 and a projected 12.5 percent between 2012 and 2013, which makes it the world’s fourth fastest-growing economy. This growth spurt is almost entirely thanks to the sale of hydropower to India, which accounted for 45 percent of the country?s revenue and 20 percent of its GDP in 2011. Flush with cash, the government plans to build ten new hydropower plants by 2020, bringing its total up to 40. Behind the impressive growth, however, are systemic problems. With a population of just over 700,000, Bhutan has one of the world?s smallest and least developed economies. Almost 70 percent of the country?s wealth comes from development assistance grants from India, in addition to substantial aid from the United States and European countries. Apart from the hydropower industry, other economic sectors, including agriculture, are struggling. Bhutan must import much of its food because only 2.3 percent of the country is arable land. Although GDP growth is robust, the country?s deficit has continued to grow and the inflation rate reached 13.5 percent late last year. Furthermore, credit growth, including loans to the private sector, has risen to the unhealthy rate of 26.2 percent, which could lead both to a high nonperforming loan rate and more inflation. 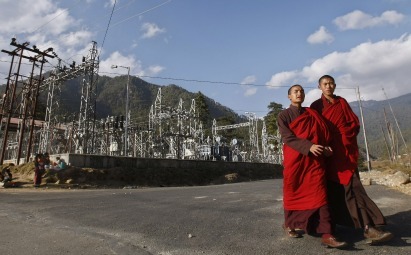 Bhutan is taking steps to correct its problems, and has won plaudits for doing so from the IMF. Furthermore, the government is undergoing impressive structural reforms. Over the past two decades, Bhutan has transitioned from an absolute monarchy to a constitutional monarchy. In the mid-2000s, JigmeSingyeWangchuck, then king, transferred most of his power to a newly founded parliament and decreed that any king could be impeached by two-thirds vote of parliament. In 2006, the king abdicated power to his Oxford-educated son, JigmeKhesarNamgyalWangchuck, who champions his father?s democratic vision. To be sure, the political transition has been imperfect. The inexperienced bureaucracy has struggled to manage the booming economy, the parliament remains unsure of how to wield its new power, and the civil service seems lost without royal edicts. Peasants, many of whom still long for absolute rule, remain remarkably subservient, with the educated elites filling well-paid government posts. Karga Lama, a journalist who has covered Bhutan, wrote to me that he wonders whether ?people at the grassroots [are] really enjoying and benefitting from the process of democracy, or [if] the few people at the upper echelon of political structure [are] taking the cream.? Indeed, 40 percent of the population are still subsistence farmers, crowded on the country?s small portion of arable land. Seeking better opportunities, many young Bhutanese are moving to Thimpu, the capital, but few are finding gainful employment. Cheaply constructed commercial and residential buildings have been erected to house new inhabitants and the city is losing its unique architectural character. Traffic jams and petty crimes have also become more frequent. But Bhutan is adapting, slowly incorporating modern culture into a centuries-old feudal society. A recent World Bank report shows that quality of life in Bhutan is improving. Infant mortality rates have declined, maternal mortality rates are falling, and literacy and enrollment rates are rising. In addition, the number of girls enrolled in primary school in Bhutan is greater than the number of boys, which is rare in Asian countries. Women, rather than men, inherit property in some areas of the country. With the support of domestic nongovernmental organizations, such as the National Commission for Women and Children and the Tarayana Foundation, the newly democratic government is implementing model educational, social, and environmental programs to help the country?s poorest citizens. Bhutan?s GDP growth might have caught the IMF?s attention, but internally, the government measures success by a different, all-encompassing standard. The Gross National Happiness index, established in 1972 by JigmeSingyeWangchuck, tracks progress using well-being indicators, such as mental and physical health, community vitality, culture, education, environmental diversity, living standards, and governance. Each of these indicators is further broken down: mental health, for example, considers psychological distress, emotional balance, and spirituality. Community vitality includes factors such as family life, safety, trust, social support, and kinship. By considering and balancing these diverse factors, the GNH framework ensures that economic pursuits will not bulldoze other priorities. For example, plans to harness a sizeable number of Bhutan?s rivers might disturb some environmentalists, but the development of Bhutan?s energy sector will take into account environmental concerns, as staked out in the GNH index. Only two dams will be built, with most plants generating power from free-flowing rivers, and the government is explicitly committed to producing green energy. Meanwhile, the transition to democracy promises greater government accountability. The electorate is slowly accepting the end of the absolute monarchy that governed the country for centuries. Elected officials and government bureaucrats are gradually coming into their own as they attempt to modernize the country, while protecting its cultural heritage. The Department of Youth, Culture, and Sports has introduced cultural education into school curriculum and encourages families to engage in traditional activities such as visiting temples or practicing indigenous songs. Other initiatives include rigorous sports programs aimed at fostering pride in personal achievement and healthy competition. At the same time, the government is attempting to alleviate youth unemployment, especially by reaching out to American hospitals to secure contracts for transcribing medical audio files. The Bhutan case study tells the story of GNH in Bhutan, a story of exploration and progress since the King declared in 1972 the goal of happiness over the goal of wealth. Happiness became much more than a guidepost or inspiration; it became an organizing principle for governance and policy-making as well. The Gross National Happiness Index is the first of its kind in the world, a serious, thoughtful, and sustained attempt to measure happiness, and use those measurements to chart the course of public policy. Sachs ended the foreword by lauding ?Bhutan?s wonderful adventure, still unfolding while already inspiring others.? It is not just Bhutan?s GDP that is improving, in other words, the country?s global importance and domestic happiness are on the rise as well.